Free Shipping Included! 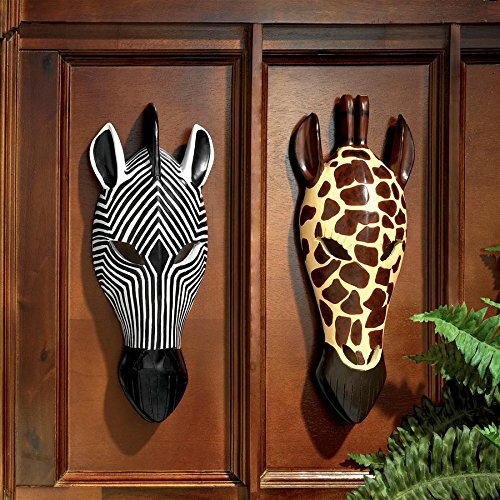 Design Toscano Tribal-Style Animal Masks Set of Two by Design Toscano at Animal Backgrounds. MPN: NG933504. Hurry! Limited time offer. Offer valid only while supplies last. Add a tribal touch to any room with these stylized wall sculptures by Nigerian-born Okulaja, who trained at the prestigious Remo Div Art School. Add a tribal touch to any room with these stylized wall sculptures by Nigerian-born Okulaja, who trained at the prestigious Remo Div Art School. Hand-painted in the natural palette of Africa, these designer resin works of art add a dimensional quality whether alone or paired alongside a favorite painting. (Set Includes: Giraffe and Zebra) Each: 5and 1/2"Wx2and 1/2"Dx14and 1/2"H. 2 lbs.